The Physics of Motion is best taught by actually showing things moving! Diagrams on a white board and pictures in a text book just don’t cut it. 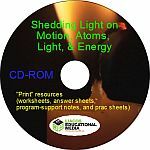 The Shedding Light on Motion series brilliantly covers all the essentials of the topic of Motion, including speed, acceleration, relative motion, the use of graphs, and Newton’s three Laws of Motion. This series is ideal for all teachers who want to teach the topic of Motion, whether they’re experienced Physics teachers or graduate non-Physics teachers who have suddenly found themselves in the deep end! Your rescue is at hand!! Why are we “thrown forward” in a head-on collision? We push off the ground to propel ourselves forward, but how does a rocket engine propel itself in space? How does James Bond survive falling out of an aeroplane without a parachute? What speed does Usain Bolt actually reach when he runs the 100m? Why do you see lightning before you hear the thunder that it produces? How fast can you kick a football? At what speed do you hit the water when you jump off a 10-metre diving platform? Can you play tennis on an aeroplane? These questions, and many more, are answered in this student-friendly, highly engaging series, so check them out! ClickView, Learn360, or Films on Demand. Just login and search for whatever video you want. HUGE SAVINGS are available if you buy multiple programs. Only $239.92 It’s a 40% discount!! All the resources are neatly arranged into separate folders and so you won’t have to download anything from the website! The programs can be ordered with a credit card by clicking on the buttons above. Schools in Australia can order with a credit card OR with a purchase order. We will send an invoice with the order. Our ABN is 74 635 864 408. They are licensed for upload to your school’s content-delivery system. You can purchase individual programs by visiting each program’s page. How do we know about atoms if they’re too small to see? Teach Energy without using much! Let your students see it.